Possibly one of the most quoted films of recent times, the year 2000 blockbuster Gladiator is the inspiration for this similarly named five reel, three row and 25 payline slot, which is sure to make you want to stand up and proclaim that you are Maximus Decimus Meridius. 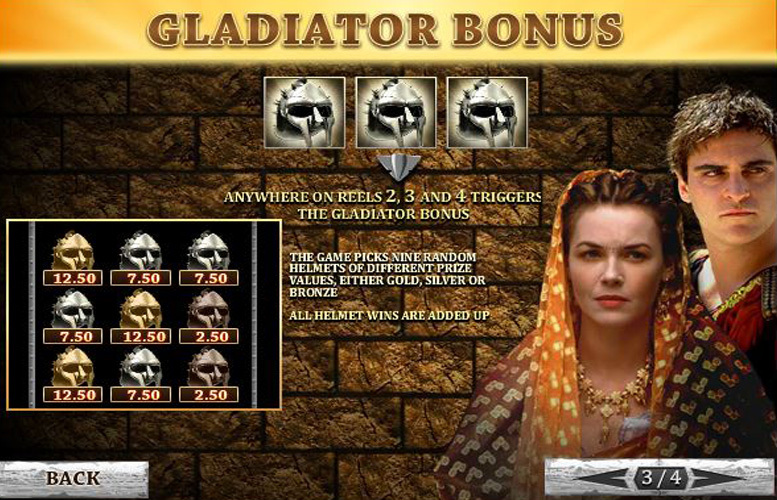 Featuring images of characters and places from the movie, Gladiator boasts a theoretical return to player percentage of 94.09%, wild substitutions, scatter wins and two different bonus rounds, amongst other features. Fans of the Gladiator film – and there are plenty of them – are sure to love this slot’s theme. As well as allowing for substitutions and instant wins respectively, the slot’s wild and scatter symbols also each trigger a different, fun bonus round. The bonus round linked to the slot’s scatters delivers free spins, multipliers, extra wilds and all sorts of other goodies which help to really boost winning potential. Gladiator’s highest payline jackpot is worth just £5,000 at the top bet level, making it a comparatively low payout. Staking options per spin are fairly limited, with wagers having to fall between a minimum of 10p and a maximum of £25. 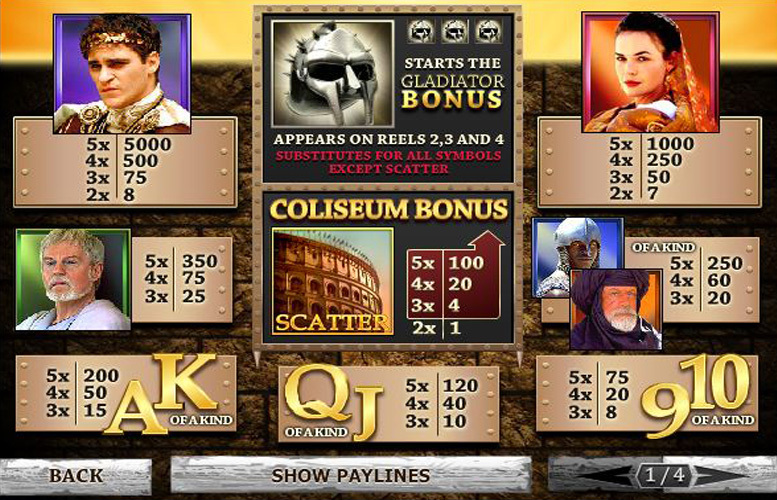 Before you get to the special symbols and related bonus features, Gladiator is a straightforward five reel slot game. As such, the top main game jackpots are achieved when five matching symbols line up from left to right along an active payline. Perhaps a little counter-intuitively, given the film’s plot, the symbol players will most want to see forming such a combination is that depicting Emperor Commodus. Five of the Emperor Commodus symbols deliver a jackpot worth 5,000 times the chosen line bet, which at the highest line bet of £1 will be worth £5,000. Whilst that top jackpot can be described as a little disappointing, where Gladiator excels is in terms of its additional game features. The slot, after all, includes wild symbols, scatters, two different bonus rounds and a gamble feature. It is the symbol depicting Maximus’ own gladiator mask which works as the slot’s wild and triggers the Gladiator Bonus Round if appearing on reel two, three and four. In that bonus round, nine helmets of randomly selected cash values appear and the sum total of those values is what players will win instantly. Gladiator’s scatter symbol depicts the Coliseum in Rome and delivers instant wins if two or more appear at once. 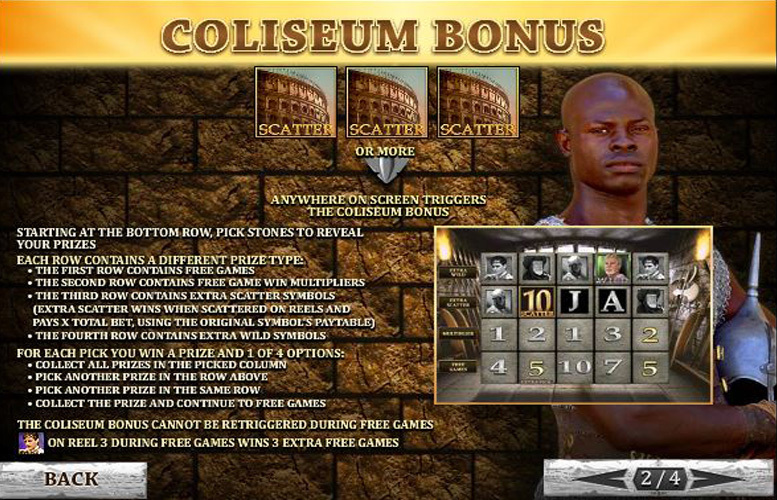 If three or more appear, too, the slot’s Coliseum Bonus round is triggered and players must select from a choice of different stones. Their choices can deliver free spins, multipliers, extra wilds and extra scatters. 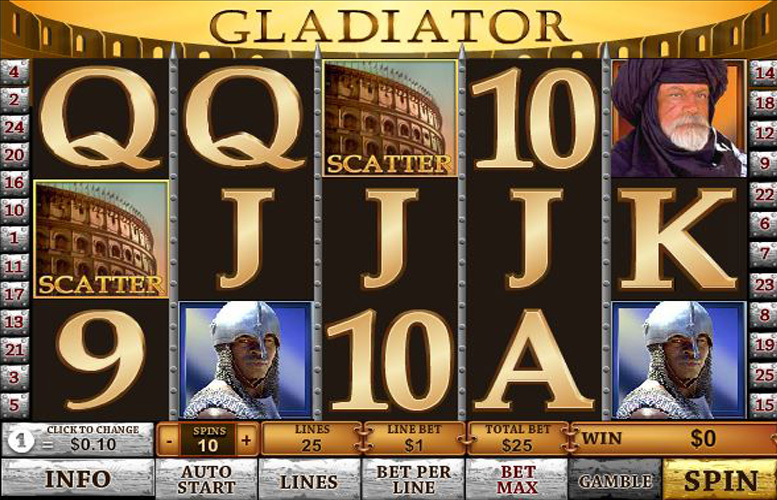 After every winning Gladiator spin players have the chance to risk their winnings in an attempt to double them. 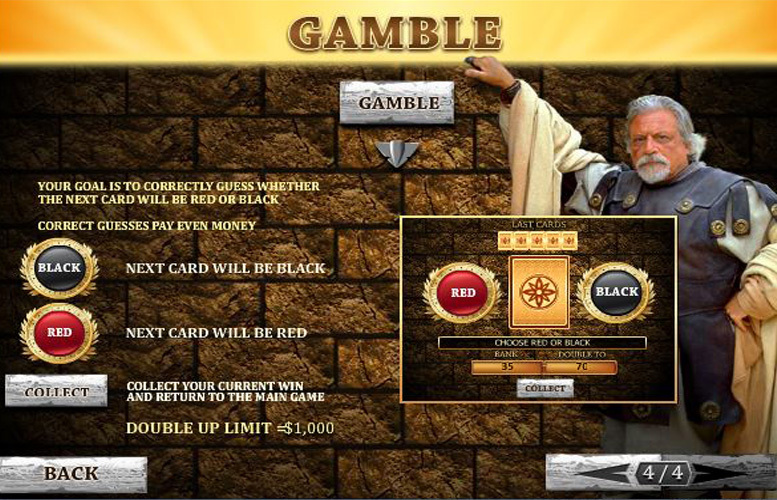 That is thanks to the slot’s gamble feature, which asks players to choose whether a card will be red or black and doubles winnings if the correct colour is guessed. All themed around the Gladiator movie and Ancient Rome in general, the most valuable of the slot’s regular symbols are those depicting characters from the film. As we’ve already discussed, it is the Emperor Commodus symbol which is most valuable but behind that it is his sister Lucilla or the Senator Gracchus who you’ll most want to see. Five of the Lucilla symbols aligned on an active payline delivers a jackpot worth 1,000 times the chosen line bet. A five Senator Gracchus symbol combination, meanwhile, will result in a payout of 350 times the line bet. If they want to change the amount they’re going to bet per spin, Gladiator players have a choice of altering the number of active paylines, the amount they wish to bet per payline or both. Anywhere between just one and the maximum of 25 paylines can be active for any spin, and there are a variety of line bet options between 10p and £1. Overall, therefore, that means that the minimum total bet possible is just 10p and the maximum is a total of £25. Gladiator is broadly recognised as one of the most popular slots around, and it is not difficult to see why. The game, after all, boasts one of the most attractive themes and is simply packed full of additional features which utilise that theme really well. Wild substitutions and instant scatter wins add to the winning potential of the main game, whilst not one but two diverse bonus rounds are also provided. Those bonus rounds help to make gameplay more immersive and introduce new ways for players to win. Gladiator is not a slot without weaknesses, however, and there are two major ones. These are that the slot’s payline jackpots are actually on the less generous side and that staking options are comparatively limited. This game has a rating of 4 / 5 with 620 total reviews by the users.